Tree Speak | Casey Trees: Join Live Green and Support Casey Trees - Tonight! Join Live Green and Support Casey Trees - Tonight! Looking for a way to get over those mid-week blues? Well for all you Live Green members out there, the answer is easy. Head to Local 16 tonight, November 16, as our partners at LiveGreen celebrate this favorite neighborhood hangout as their newest Live Green Spot. Tonight from 6 til 8 p.m., Live Green members will receive complimentary VeeV Skinny Mojito and appetizers by Café Green. The best part? From now on, all members receive 10% off their tab at Local 16! But remember, these discounts and many more apply to Live Green members only – so get your membership today! Simply go to to www.livegreen.net/join and type in the referral code: CaseyTreesLG. By doing so, a donation of $10 dollars will be made to Casey Trees! 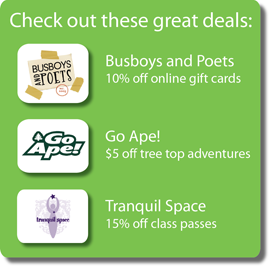 Join the thousands of Washingtonians who already enjoy the discounts and deals offered daily around the city, while helping us add some trees to the District. And be sure to come out tonight to Local 16 (1602 U Street, NW) and get a taste of what a Live Green membership can do for you! Planning for a Sustainable D.C.